LW Haddow Plumbing & Heating Limited, based in Perth Scotland, provide new installation, service and maintenance for plumbing and heating across the Central Belt, including Perthshire, Angus and Fife. They also provide electrical services, including Periodic and PAT testing, night-storage heating and wiring. In addition to traditional forms of heating, they can also install and maintain renewables, including Solar PV and Hot water systems, Air Source and Biomass solutions. 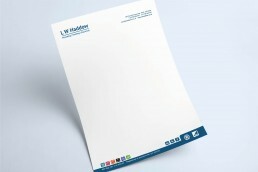 Winter and Simpson Print has provided a range of printed materials for LW Haddow including branded letterhead and financial stationery.